If you’ve lived in Loudoun for any period of time, or are considering moving here, you’ve probably realized that many homes here are part of homeowners associations. Homeowners associations (HOA) are legal corporations formed by real estate developers to market, to manage, and to sell homes and lots in a residential subdivision. They are most commonly formed for condominiums and planned urban developments (PUDs), a category which includes suburban communities. Popular Loudoun neighborhoods like Brambleton, Willowsford, and One Loudoun are all part of HOAs that have varying kinds of covenants and requirements. HOA Articles of Incorporation typically grant developers privileged voting rights in governing the association during its beginning stages, while providing the means for the developer to exit financial and legal responsibility for the organization, transferring ownership to the homeowners of the association. This transfer typically occurs after a predetermined number of units have been sold — often two-thirds of the available lots or units. Once a neighborhood is totally built out, you and your neighbors will carry the responsibility for the association. Each HOA enforces its own governing documents in the form of restrictive covenants, by-laws, architectural guidelines and regulations. 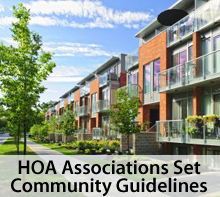 Together, the “rules” of an HOA are meant to define the community standards for the purpose of protecting property values. The restrictive covenants vary widely from association to association; they may include guidelines on issues as varied as where parking is permissible, planned architectural improvements, or landscaping rules. For homes governed by an HOA, membership in the homeowners association is a condition of purchase; buyer are not permitted to opt-out. In Virginia, it’s specified in the contract to purchase whether the home is governed by an HOA, condo association, or both. If you are selling, you are required to provide the purchasers with a package of HOA documents prepared by the association, including up to date budgets, bylaws, covenants, and guidelines, as well as any open violations or past due fees for the home. This is called the ‘resale disclosure packet’ and it usually costs around $250, paid at the time it is ordered. When the buyer receives the packet, they have three days to review the information, and if any details change their mind about the offer, they have the right to void the contract. If you are thinking of buying, here’s a great post on what to expect as part of the process.